Sometimes I amaze, even horrify myself with the amount of time I spend on research. But in this case it was easy peasy; and a massive testament to the power of Google. 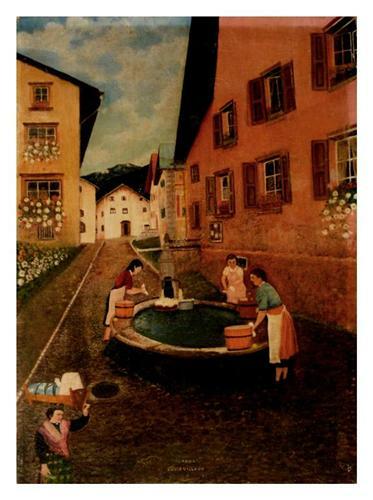 I just entered GUARDA SWITZERLAND in Google Images and immediately not only the village appeared but the very (distinctive) water pump in the town square. Made me go all tingly. I'm sure that everyone in the town now washes their clothes care of Electrolux; but do they have so much fun? Here they all are in the old days, captured in this almost certainly contemporaneous painting, beating the grime out of the family smalls and gossiping about their men folk. The figure in the foreground is of particular interest; seems to have some headgear which enables her to carry baby, crib and all, on her head! The painting is obviously old, based on the physical condition of surface (it takes quite a while to develop that depth of craquelure), the condition of the reverse of the canvas and the general style of painting. I'd say it was pre First World War, on a best guess basis.